One of the most historic motels operating on Route 66, still in it's original "motor court" configuration, including garages. Fabulous neon display, and gift shop features unique Blue Swallow items not found anywhere else. 1620 E Route 66 Blvd. 2500 East Route 66 Blvd. 1102 E Route 66 Blvd. 722 E. Route 66 Blvd. 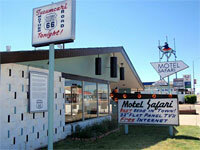 Built in 1959 - The Motel Safari is a historic, classic motor court on Route 66 in Tucumcari, NM with mid-century modern architecture and decor. Retro boomerangs, cylinders with perforated light holes, oozing brick mortar and a counter stacked protruding brick facade are just a few of the "Googie" elements you will find - yet the Motel Safari also offers all the modern amenities you'd expect to find in a hotel today, plus the Best Beds in town. So Come Get Your Kicks on Route 66, in Tucumcari Tonite! General hardware and feed store, gift shop and Watson's BBQ. See our website for a better idea of what we are all about. 442 Old Las Vegas Hwy. As New Mexico celebrates its 100th birthday, EL REY INN relishes its 76th year in Santa Fe. The original El Rey Court along the historic Rt. 66 opened in 1936 with 12 rooms. The current inn's 86 rooms and suites offer value and Southwestern style, a convenient mid-town location and true hospitality. 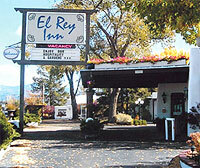 Suites with kitchenettes, rooms with fireplaces, continental breakfast and close proximity to fabulous New Mexican and Mexican cooking make El Rey Inn a charming retreat. Free Bottle of Wine in your Room for Rt. 66 Directory Guests. Kakawa is a specialty chocolate house known and loved for its fine dark chocolates, chile chocolates, and Mesoamerican, Historic European, and Contemporary chocolate elixirs (drinking chocolates). 460 West San Francisco St.
3007 So. St. Francis Dr. Jewelry, toys, state souvenirs, & novelties. In business since 1942, Duran Central Pharmacy is one of the oldest commercial establishments in Albuquerque. The pharmacy is a full-service pharmacy specializing in compounding, vaccines, compression hosiery, and medical supplies. In addition, we have a large selection of unique gift items, bath and body products, gourmet chocolates, cards and Southwestern books. The original soda fountain has grown into a small restaurant, serving New Mexican food and is famous in the area for its red and green chile. Enchanted Trails is primarily an RV park with a great store. We carry Native American arts & crafts, regional foods, pottery, jewelry, fun travel trailer collectables and a line of uncommon Route 66 items. We also have several vintage travel trailers that rent nightly. Whether It's A Light Breakfast With The Best Coffee In Town, A Gourmet Sandwich For Lunch Or Mega Burgers And Beer For Dinner, Angela's Cafe Provides A Variety Of Culinary Delights Sure To Satisfy Every Palette! The Gallup Cultural Center, housed in the "Old Santa Fe Depot" on Historic Route 66, is a joint venture of the City of Gallup and the Southwest Indian Foundation. The building was built in 1923 and was originally part of a larger Atchison Topeka Railroad and Fred Harvey complex. The plush "El Navajo" hotel, once connected to the old railway station on the west side, was designed by Mary Colter, who designed and decorated most of Fred Harvey's hotels, including the famous lodgings at the Grand Canyon. Many architectural historians say that the El Navajo and the adjacent depot building were among her crowning achievements. Unfortunately the "El Navajo" was torn down in the 1950's to make way for the widening of Route 66. When the Southwest Indian Foundation took over the building in the mid 1990's to run it as a cultural center for the City of Gallup, they completed the renovation of the building by decorating it with photos, furniture and trim reminiscent of the "El Navajo" era. Today the Gallup Cultural Center is a community center, which houses the City of Gallup Visitor Center, the Storyteller museum (a cultural and historic exhibit of the Gallup area), the Master's Gallery (a modern Native American Art Gallery), a gift shop and Angela's caf�. Perry Null Trading / Tobe Turpen Trading Co.